Hi Readers, Sharing my real trade on L&T on August 30. L&T was in our buy list on pre-market calls on August 30. 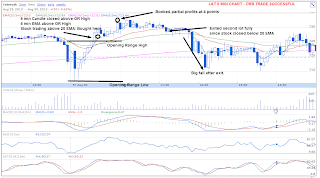 The stock made an excellent Opening Range Breakout close to our buy above level. crossover. The stock moved up by 6 points giving us a chance to book profits on half the holding. 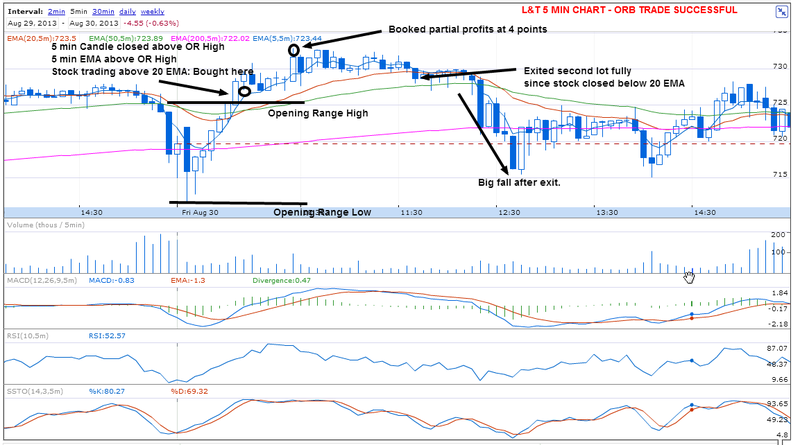 However , within minutes the 5 min candle closed below 20 EMA, which is an exit sign according to our trading system. So the trade was fully exited with 1 lot on profit. Here , I want to highlight the discipline required in trading. If we see an exit sign based on our trading system, it is important to exit even if you are on profit. Else the entire gains could be erased in no time.